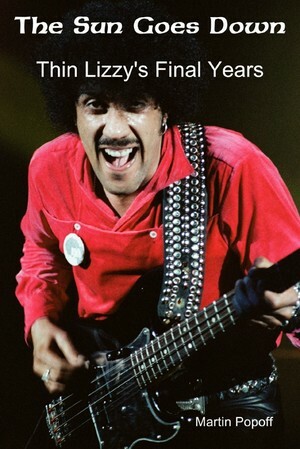 Dublin's Thin Lizzy have become one of the most revered cult acts of all time. Studious and discerning fans of hard rock the world over revelling in the storytelling acumen of the legendary Phil Lynott and the craft and class of his band. 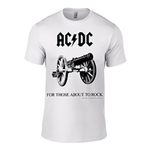 Through numerous new interviews with most of the principles involved and a mountain of painstaking research, The Sun Goes Down examines the band's career from the making of Bad Reputation in 1977 through to 1983’s Thunder And Lightning and the last concert in Germany. Alcohol and drugs wreaked havoc between band members, producers and managers. Line-up changes and a mostly grinding existence finally took its toll after the smash hit records and sold-out tours. Popoff's celebrated record-by-record methodology highlights a new appreciation of the deep album tracks hiding within this band's often forgotten later years. 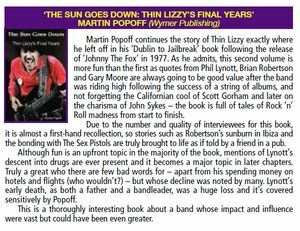 The book also reveals Phil Lynott in all his dastardly guises, making The Sun Goes Down, an essential read for the devoted fans. Popoff looks deep inside the band’s ups-and-downs. 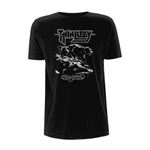 His engaging manner of storytelling should appeal to both Thin Lizzy fanatics as well as classic rock fans.